90SOLID2019 Toyota Corolla HatchbackOverall ImpressionPlenty of standard equipment. Manual transmission version is fun to drive. 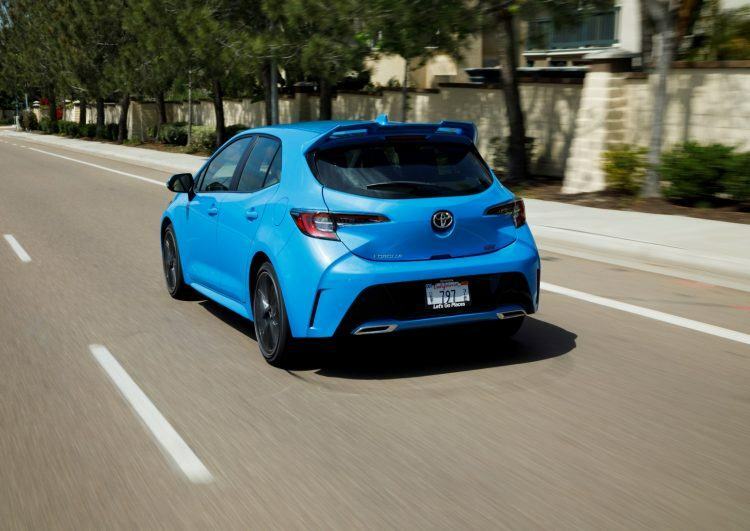 Performance lacks in a few key areas, however.ProsMaterial Quality Safety Features Infotainment FeaturesConsRear LegroomCargo CapacityThose wanting a compact car with attitude should take a look at the new Toyota Corolla Hatchback. If you want a safe compact car, the Corolla gets a suite of safety features not typically found in this segment. Add in a dash of the Corolla?s excellent fuel economy and its high resale value, and you have all the ingredients for a car that will please budget-conscious consumers. Over the weekend, we drove the top-trim, 2019 Toyota Corolla Hatchback XSE. The redesigned Corolla debuts in a new hatchback body style and comes with improved interior design and materials. Apple CarPlay and Amazon Alexa are standard. The 2019 Toyota Corolla Hatchback XSE ($22,990) is the sportier Corolla. It comes standard with 18-inch machined wheels, unique front-end styling, a rear spoiler, steering-wheel paddle shifters (for CVT automatic models), sport front seats, SofTex upholstery with cloth inserts, and a sport-style gauge cluster. Also included are the XLE’s upgraded headlights, bumper-mounted LED daytime running lights, and leather-wrapped steering wheel. The XSE is the only trim that can be had with a manual transmission, which brings with it keyless ignition and entry, plus an upgraded infotainment system. The XSE also adds heated front seats, a power driver’s seat, and full SofTex upholstery. This XSE tester came with the optional adaptive headlights, rear window spoiler, and protective package. MSRP including destination: $25,123. By comparison, the 2019 Toyota Corolla Hatchback starts at $19,990. We slid into the XSE Hatch and saw the most up-to-date cabin yet for Toyota?s compact car. It features a stylish dashboard, a sporty steering wheel, and a six-speed gear shifter that fit perfectly into our hands. We particularly liked the traditional audio and climate controls unlike some that are put in difficult-to-use touchscreen menus. When we did need to use the eight-inch touchscreen, it offered up large buttons, clear graphics, and quick responses. It could be one of the easier infotainment systems to operate in this class. Various connectivity features came courtesy of the Entune App Suite with services like Bing, Facebook, Yelp, Pandora, and real-time traffic data.